The Brick Theater produces a lot of festivals – it’s kind of their thing. But festivals at the Williamsburg experimental venue aren’t your garden-variety observance of artist or genre; they’ve become the theatre’s way of exploring aesthetic and cultural intersections. Sure, some of the dozens of festivals produced during the theatre’s first decade have had a chimerical bent (The Antidepressant Festival comes to mind), but just as often they examine critical connections between live theatre and other arts or performative elements. Their annual Game Play festivals, for example, present works that probe the relationship between performance and video gaming. Others, like the Comic Book Theatre Festival, bring divergent artistic forms to the theatrical table. It’s what Artistic Director Michael Gardner calls “hybrid theatre,” and it makes one wonder what took them so long to come around to sound design. 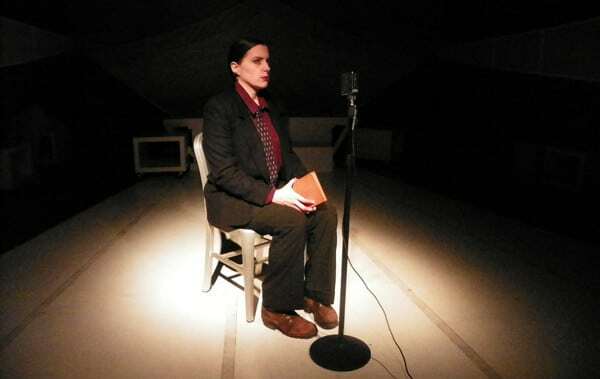 But come around they did, and for two weeks starting June 6th, the Brick Theater will present sound scape: a festival of 12 productions that celebrates the sound designer as a driving creative force. While sound and theatre aren’t exactly incongruous forms – sound, of course, is an integral element in theatre – the aural is normally relegated to the role of servile valet to the mighty image, and this is precisely what makes it cry out for a festival of its own. Another interesting sonic play on the past is Commotion Collage, which appropriates elements from the Dadaist simultaneous poem – a form pioneered in 1916 by Tristan Tzara at the Cabaret Voltaire, in which multiple voices and other sounds combine in a singular sonic composition. Director Roger Nasser’s appropriation liberates the original form from of its historic cultural context, and yokes it into service as a building block for a more contemporary version of the acoustic collage. “I’m going to take fragments of the original poems and weave them throughout, as part of the background,” he explained, but he’ll also include contemporary sounds, such as answering machine messages, white noise, and a riff from the Family Ties theme song – artifacts from an electronic culture that didn’t yet exist in 1916.